Who ever said that Gingerbread houses are just for Christmas? We see them a lot for Halloween now but for Valentines Day?!?!? 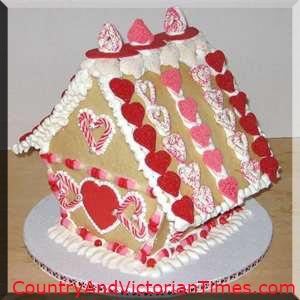 Here we have a great simple gingerbread house design assembled with all kinds of Valentines Day goodies. This would be a great gift and can be stuffed with even more goodies for a special gift. I have seen these for Halloween and Christmas that the roof is actually a lid – how cool would that be? This entry was posted in Crafts ~ DIY ~ Projects, ~Valentines Day and tagged candy, gift, gingerbread, gingerbread house, house, red, valentine, valentines day, valentines. day. Bookmark the permalink. Yes it does – but I think I would manage! I have another I am posting today!